Built in 1918, the Inn on Charlotte Street is an elegant bed and breakfast in the heart of the nation's oldest city. We are just steps from the bayfront on a quiet brick-lined street. The home has been lovingly restored to reflect its original grandeur and is carefully decorated with antique furnishings and accessories. 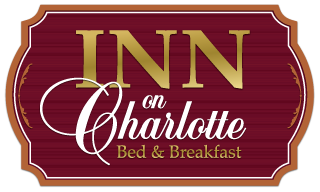 As a bed and breakfast since 1993, the Inn on Charlotte has become known for its Southern hospitality which, of course, means relaxation and comfort for you. At 8:00 am each morning Coffee/Hot water is available in the Parlor. The Inn on Charlotte is known for its tasteful dining room where each couple has a private table, and can be seated in comfort all at one time, and delicious 2-course breakfast is served at 9:15 am each morning. Typical morning recipes might include for the first course: Poached pear with a chilled almond cream sauce. And, as the 2nd course: Spiced Apple pancakes with Rod's homemade vanilla syrup. Or maybe: Chilled strawberry cream soup to start with and, Eggs Benedict Casserole slathered in hollandaise sauce served with our Sour cream Banana Bread with Blueberries to follow. The Inn on Charlotte likes to switch each morning from a Sweet breakfast, to a Savory one. And always, please make us aware of any food allergies or dietary needs when booking. Relax in the casual elegance of our comfortable parlor or enjoy our large, shaded front porch as you sip a little lemonade, tea, or filtered water throughout the day, and a social hour each evening. You'll soon find yourself slipping into the leisurely pace of the historic district of Saint Augustine, Florida, the nation's oldest city. To our European friends: The windows at the Inn on Charlotte Do Not Open. Please do not attempt to open the windows. And, we are cooled by a whole house or, Central Air Conditioning system. It turns on/off constantly to cool all the rooms upstairs and is controlled by a single thermostat in the hallway. We ask that everyone be considerate when adjusting it. A beautiful brick home was constructed at 52 Charlotte Street in 1918 for a local attorney, Levi Nelson. It was built at a time when America was riding the wave of an economic high. The Great War (WWI) had been won. Modern wonders, born of the Industrial Revolution, were creating a more leisurely, carefree lifestyle in Florida. It was a lifestyle that would soon become known as the "roaring twenties." The spirit of those good times comes to life as soon as you walk into the Inn on Charlotte. Attention to detail inside and out, during its 2003 restoration, and the use of quality antiques and grand reproductions, have captured the feeling of luxury in our bed and breakfast that denotes an era of prosperity. We think Levi Nelson would have approved of the cable TV, wireless internet access, and the many other modern B&B amenities. Nationally recognized by Southern Living Magazine, your experience here at the Inn on Charlotte differs from that of most other bed and breakfasts in St. Augustine. Our home becomes yours to enjoy. Relax in the elegant, yet inviting, parlor with two comfortable couches. Or lounge on one of the large, cool porches and just sit and watch the world go by. If you feel inspired to get up and move about, no other bed and breakfast in St. Augustine is better situated for exploring all of the city's attractions. Dozens of great restaurants are just steps away. Come experience the casual lifestyle that makes Saint Augustine, Florida so unique and appealing. If you need information about any of our services, please feel free to use our contact form, email us, or call us at 904-829-3819.